Pulling down on the lever causes the turn signals on the left side of the car to blink. Pushing upwards on the lever causes the turn signals on the right side of the car to blink. As the turn is completed, the lever will automatically return to the center position and turn off the turn signals at the same time. If either turn signal indicator light blinks more rapidly than usual, goes on but does not blink, or does not go on at all, there is a malfunction in the system. Check for a burnedout fuse or bulb or see your Hyundai dealer. To indicate a lane change, move the lever up or down to a point where it begins flashing. The lever will automatically return to the center position when released. 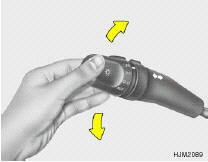 To operate the headlights, turn the barrel on the end of the multi-function switch. The first position turns on the parking lights, sidelights, tail lights and instrument panel lights. The second position turns on the headlights. NOTE: The ignition must be in the "ON" position to turn on the headlights. o The purpose of this feature is to prevent the battery from being discharged. The system automatically turns off the headlights and parking lights when the driver removes the ignition key and opens the driver- side door. o With this feature, the parking light will be turned off automatically if the driver parks on the side of road at night. If necessary, to keep the lights on when the ignition key is removed, perform the following: 1) Open the driver-side door. 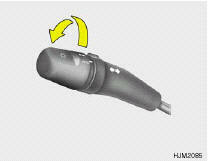 2) Turn the parking lights OFF and ON again using the light switch on the steering column. To turn on the headlight high beams, push the lever forward (away from you). The High Beam Indicator Light will come on at the same time. For low beams, pull the lever back toward you. To flash the headlights, pull the switch lever toward you, then release it. The headlights can be flashed even though the headlight switch is in the "OFF" position. 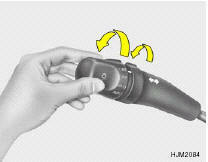 To operate the automatic light feature, turn the barrel on the end of the multi-function switch. If you set the multi-function switch to "AUTO", the tail lights and headlights will be turned automatically on or off according to external illumination.